Manage UNLIMITED rooms and UNLIMITED bookings. 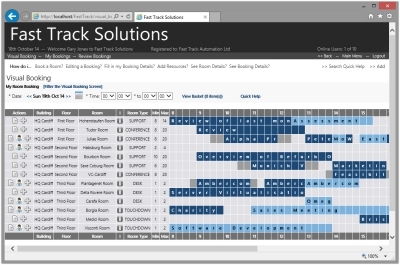 The only cost to use the Fast Track Room Booking software is for SHARED USERS. All other considerations are UNLIMITED. £29 per User per Month. 2 Shared Users supports 5 people, 5 supports 20, etc..
Fast Track Room Booking is available to any staff and customers you allow access. A CLINICAL NOTES area for recording/editing/reviewing is available by special role. Fully permission controlled, it will save your staff time, by automating meetings, clinical appointments, training, conferences, hot-desks, catering, A/V equipment, visitors and more. CLICK HERE to request WEBINAR Details, and let us know any Requirements you may have. Fast Track Room Booking has a low start-up cost, and contains the everyday and advanced mechanisms needed to automate all booking processes. 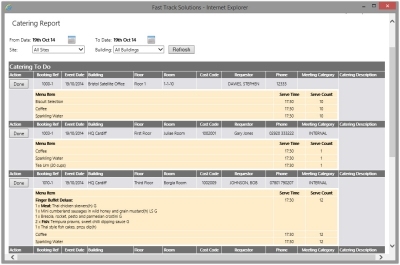 The Fast Track Room Booking System will inexpensively provide Self-Service enquiry or booking access for your staff and customers (as you allow), increase your room utilisation % and reduce your costs.